Heatmap Analysis: Top 5 Pages To Focus Your Attention On! Marketers can map the performance of their campaigns from various data sources. Most often this leads to them being overly obsessed with metrics. But, not all numbers penned on paper help derive befitting conclusions that promise results. This is where qualitative information about visitor behavior helps to connect the missing dots in user research. 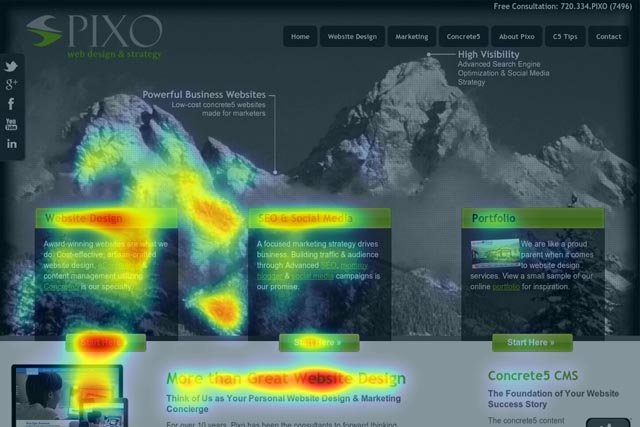 Qualitative tools, such as heatmaps, give you richer insight into what actions visitors perform on your website. They inform you about the path visitors take on your platform, the way they interact with your site’s content, the elements they like the most, and where they bounce off. This information about your users can help you make informed decisions about UI/UX changes on your website. 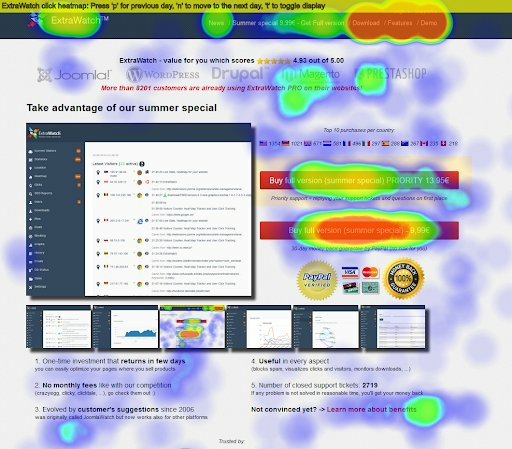 This blog delves into how heatmaps, as a qualitative research tool, can help map the performance of your website’s five prominent pages, namely – home page, landing page, product page, blog page and checkout page, to help you uplift conversions. But before that, let’s first understand the basics of heatmaps. 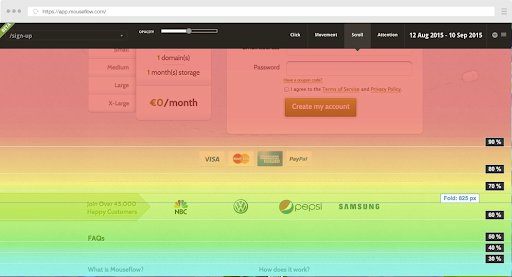 A heatmap is a smart, analytical tool that uses a system of color codes to graphically represent different values of a web page. It allows marketers to analyze different page elements in the form of colored visuals and see which areas are getting maximum traction. 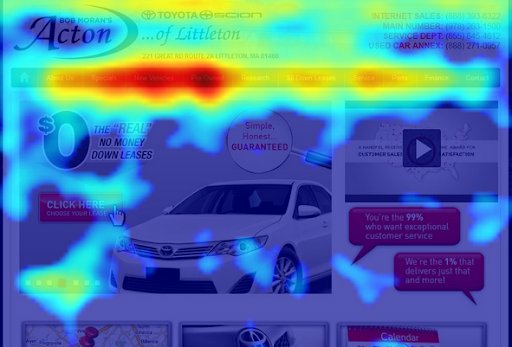 This heatmap, for instance, shows page areas where visitors are clicking the most. While the “hot” sections in red and orange color represent maximum user attraction, the “cold” sections, typically highlighted in shades of blue and green, show areas where they visit the least. Think of heatmaps as a form of visual storytelling tool. They create a beautified picture with the help of special tracking scripts. These scripts indigenously interact with different page elements and record every move made by a visitor on a particular web page, and represent this data in the form of visuals. Page elements which are getting maximum and minimum visitor attention. Whether or not important page elements, such as CTAs, banners, etc. are in their prime position. visitors are able to use your internal site search to reach their desired destination. Such in-depth information aids in understanding whether or not your homepage elements are contributing to your main objective – reducing bounce rate and driving new users into your conversion funnel. Page content is effective enough to influence a visitor’s decision. Navigation menu is well-placed and omnipresent to ensure visitors do not drop off in the middle of their search. Demo images/videos are influencing visitors and propelling them to take the desired action. Call-to-action buttons are clear, concise, and visitors are clicking on them. Knowing what draws the attention of your visitors can assist in making necessary amendments to fuel conversions. Example: Brothers Leather Supply Co. is one of the leading leather good manufacturing companies in Michigan, USA. Running their business for a while now, the company was unable to uncover the reason behind low conversion rate. They then decided to use heatmaps on their product pages and found that product image thumbnails were attracting maximum attention. 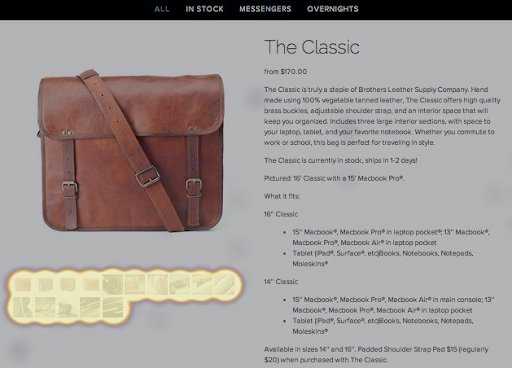 Analyzing the data, Brothers Leather Supply Co. introduced more thumbnail images to their product pages. This eventually increased conversions for them. whether or not your visitors are liking the blog posts. Page elements which may be distracting the visitors. Smart ways to declutter the page to make important elements, such as CTAs, clearly visible. Visitor behavior. Are they scrolling till the end or bouncing off in between. If you need to add extra elements to keep the visitors hooked. For instance, even though HubSpot’s end-of-post banner CTAs are visually appealing, they found that their blogs were only generating a small number of leads. HubStop then decided to integrate heatmaps and look for loopholes. 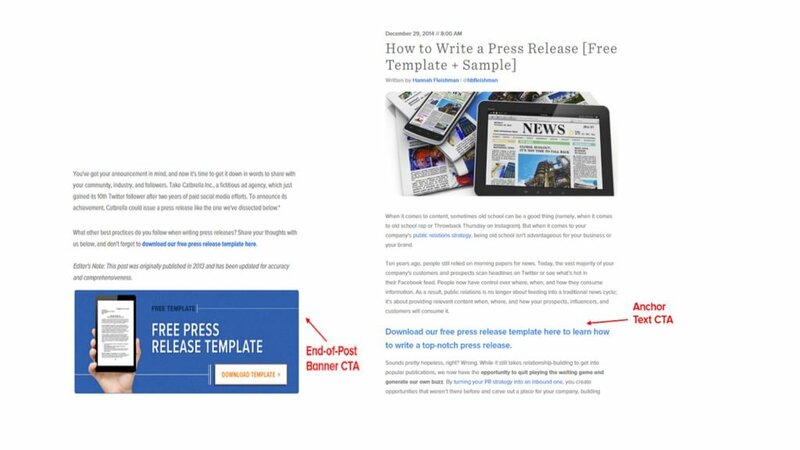 They discovered that by placing their anchor text CTAs just below a blog post’s introduction paragraph instead of placing them at the end, helped them generate more blog leads. This is because visitors saw the CTA at the beginning of the post and not at the end, which typically grabbed more attention than before. Product Pages: The quality and content of a product page can make or break a deal for your business. Heatmaps allow you to study many critical aspects of your page elements and how they’re interacting with your visitors. If the product descriptions are influencing your visitor’s buying decisions. If the product prices are prominently visible to the customers. Whether or not your visitors are focusing their attention on product images and demo videos. The elements which are distracting your visitors, such as pop-ups, etc. If your CTA catchy enough to attract customers. The overall structuring of your page – is it good-to-go or should you make some changes. The page elements which are distracting your visitors from completing their purchase. The performance of page buttons. For instance, the “Make Payment” button is not working properly. The form present on the page is too lengthy and complicated for visitors to fill and proceed. Clickable elements which users are not able to figure out and vice versa. Now that you know all about heatmaps, it’s a good time to go back and implement them in your optimization strategy.